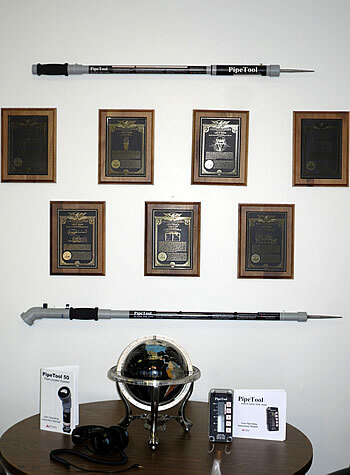 Pipe Locating Systems by Heitman Laboratories, Inc.
Heitman Laboratories is the developer, patent holder, and the manufacturer of one of the largest selling underground plastic pipe locating systems in the world. Our systems are both the most effective and the most cost effective systems available. We continue to act as the only authorized repair center for our systems and as a result we have over 20 years of field testing and involvement with end users. After over 20 years of marketing exclusively through our distributors, we have decided to roll out a private label instrument that we can sell directly to the end user that has yet to have been reached by the catalogs and websites, etc. of our distributors. This direct marketing approach will offer additional access for these potential customers. Our unique technology enables the user to easily locate plastic pipe, cement pipe, concrete transit, and other non-metallic pipe that is often not easily located using other methods. The detection of plastic pipe is accomplished through use of pressure waves or pulses both generated and detected by our patented equipment. Heitman Laboratories has manufactured the RD500 pipe Locator System sold exclusively through our largest distributor world-wide since the original development of the concept. We also manufacture the Aquatrac 50 and the Aquatrac 100 for another of our major distributors. We continue to serve as the only authorized repair center for both of these product lines as well. Our TransOndes (pulse wave generators) have been both designed and calibrated for the proper field application and are sold as kits to facilitate use of the plastic pipe locator systems. Our kits include the products needed to access the three major water sources so that proper pressure waves can be generated safely for the specific applications being located. These kits come specifically designed for use in low power sprinkler type pipe systems, medium power meter pit systems, and high power fire hydrant systems. They include the TransOnde as well as the most common fittings needed for application in the field. When these kits are combined with the Model P50 PipeTool™ Pipe Locating System or the Model P100 PipeTool™ Pipe Locating system ease of location is assured and risks of damage to the system being tested are limited. Our typical customer is anyone that regularly has the need to locate plastic water pipe regardless of the reason. This would include but not be limited to rural water companies, sprinkler or irrigation companies, public utilities, contractors, developers, pipe locating services, and municipalities. We offer a limited one year warranty against manufacturer defects that covers parts and labor. We can do this because we know our equipment is manufactured to the highest of standards and constructed with parts made in the USA. We are proud to say that we seldom ever have to worry about warranty repairs because our line of plastic pipe locator systems is durable and designed for the kind of field use that we know our customers will subject them to on a daily basis. Copyright 2013-2018. Heitman Laboratories Inc. All rights reserved, worldwide.